SeaRox Lightweight Solutions | Go for maximum performance with minimal weight! Do you want to reduce your energy consumption while increasing your performance? The SeaRox FB 6000 Fire Boards and the new SeaRox FM 6000 Fire Mats combine the solid performance of conventional ROCKWOOL Technical Insulation stone wool with an exceptional lower weight (up to 40% weight savings). 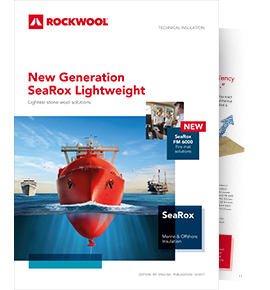 These high performing, lightweight solutions set a new standard in the marine and offshore market where weight savings and fast installation are essential to generate a higher energy efficiency and financial benefits. The SeaRox FB 6000 Fire Boards and the FM 6000 Fire Mats are tailored to the needs of the marine and offshore industry. The lightweight solutions have been developed to cover most conventional on-board applications. Fill in your details below to request your free introduction set.